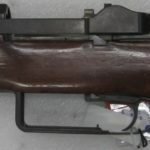 This post accompanies the nineteenth in a series of collaborative videos produced with ARES Researcher Ian McCollum, who also runs the Forgotten Weapons blog and YouTube channel. Using access to unique collections facilitated by ARES, this series of videos will examine a range of interesting weapons over the coming months. Each video will be accompanied by a blog post, here on The Hoplite, and supported by high quality reference photographs. Embarrassingly, in this case we seem to have misplaced the images. ARES Research Assistant Miles Vining has graciously allowed us to use his ‘quick and dirty’ reference images whilst we rectify the situation. Higher quality images will be posted in our next round of visits to the collection – Ed. George Fosbery is best remembered for his Webley-Fosbery ‘Automatic’ (self-cocking) revolver and his ‘Paradox’ shotgun rifling system. He arguably also deserves credit for one of the most significant firearms design elements in history; the multi-lugged rotating bolt with integral claw extractor and plunger ejector. This is usually credited to Eugene Stoner, as part of his revolutionary design for the ArmaLite AR-10 (1956), which of course evolved into the ubiquitous and important AR-15 pattern. 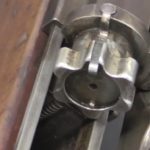 This bolt and barrel extension solution allows for a consistent and accurate lock-up and a lightweight receiver, since the extension and bolt bear the pressure of firing and no additional locking surfaces or over-building are required. 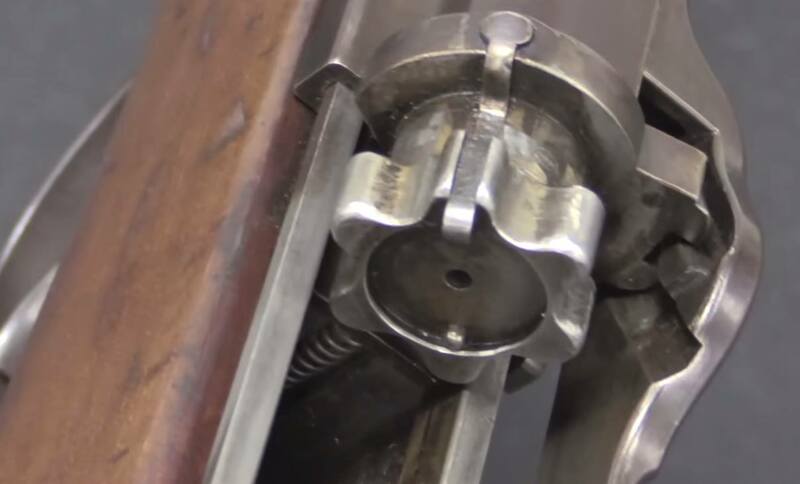 The vast majority of modern self-loading rifles utilise either this system or the AK twin-lugged bolt and trunnion approach. 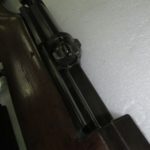 Clearly in 1891, when Fosbery first patented this design, he was not anticipating today’s trends in rifle design, but it is intriguing that he arrived at the same solution to the problem of locking mechanisms as Johnson (1939) and Stoner (1956). 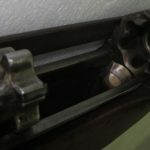 Even more interestingly, whereas Johnson machined an ejector groove in his bolt (for a receiver-mounted ejector), Fosbery’s bolt has the later Stoner plunger ejector built into it. The designs are so similar that it is tempting to imagine the involvement of a DeLorean somewhere in the design process! As an important caveat, it is quite possible that Stoner or Johnson never saw Fosbery’s patent or his gun. The two designs are not in fact identical, the Fosbery having six radial lugs, Johnson and Stoner opting for (effectively) seven. Fosbery also placed the extractor within a lug, rather than omitting that lug as modern Stoner bolts tend to. The lugs themselves also differ in profile, although there is a reason for this and another interesting historical ‘echo’ to note. In recent years, Knight’s Armament Corporation developed a radiused bolt lug profile similar to that seen in the original Fosbery bolt. This was done (presumably without any awareness of the Fosbery effort) to meet a specific user requirement, whereas in the Fosbery it was likely done due to the inherent weakness of square lugs, given the metallurgy of the day. Fractured lugs are still a failure point today, albeit in extremis. The gun itself is not well documented, although the general arrangement is outlined in British patent no. 11,339 of 1891. Nor is it known when this example was constructed. Ian’s working theory is that it was built as a rifle and modified several times to serve as a testbed for different ideas. 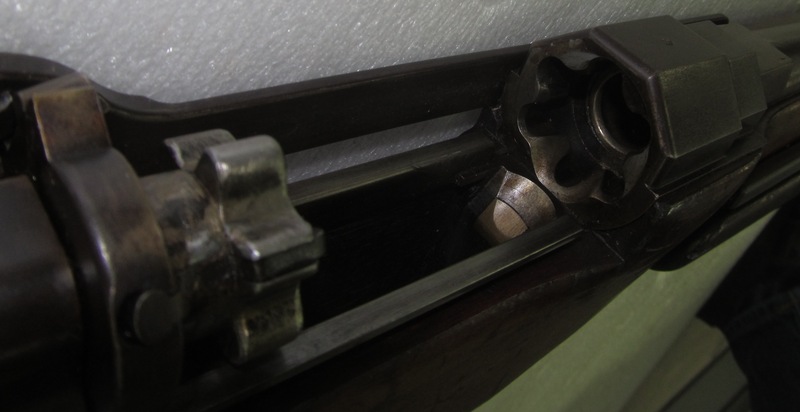 The trigger guard/magazine housing has been altered, and notably, the barrel has been replaced by a 1909-dated Winchester 16 bore shotgun barrel. 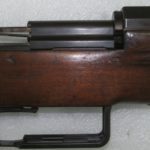 What profile the original barrel might have had is not known, but the bolt and barrel extension are certainly scaled for a large cartridge. Clearly a magazine of some sort was originally fitted, but it is not clear how this would have functioned. The trigger mechanism intrudes into the space that would surely be required for a cartridge to feed. In any case, the design came to nothing commercially and only two examples survive today. 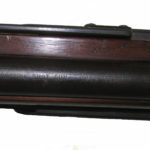 Pump-action shotguns did not catch on in the UK, and Fosbery’s bolt was never married to any of the several early self-loading designs then in existence. Indeed, this may not even have been practical at the time even if it had been thought of. Nor is there any evidence of military trials, which is not surprising if Fosbery thought of his bolt as a feature best applied to shotguns. The present-day reality is that such low pressure ammunition does not require such a stout and sophisticated mechanism. A simple tilting bolt acting in a locking shoulder is sufficient for most pump-operated designs. Baker, David J. and Lake, Roger E. 2010. ‘Paradox – The Story of Colonel G.V. Fosbery, Holland & Holland and The Paradox Rifled Shot and Ball Gun Vol.1’, p.45-47. Vining, Miles. 2014. ‘Fosbery’s Pump Shotgun’. Forgotten Weapons.